As it is in the month of Magha that the sun enters the Makar Rashi or sign on the zodiac known as Capricorn, this Sankranti is known as Makar Sankranti. The terms come quite literally from the fact that the sun leaves the Tropic of Cancer and enters the Tropic of Capricorn. The ensuing period is also known as the Uttarayan Punyakalam.The most famous celebration of the arrival of this auspicious period is at the Kumbh Mela, celebrated Allahabad, Haridwar, Ujjain, and Nashik. Makar Sankranti is also celebrated as a harvest festival inalmost all parts of the country. Known as Bhogali Bihu in Assam, Pongal in TN, Lohri in Punjab, Haldi Kumkum in Maharashtra, Khichiri Sankranti in Uttar Pradesh, and Uttarayan in Gujarat, Makar Sankranti is celebrated with kite flying competitions, folk dancing, bonfires, decorating cattle, and of course sharing sweetmeats. While Mitha Pongal, Kurmure Laddoo, Sarson ka Saag, Khichiri, Ariselu, Ellu, Sugarcane, are all foods made and shared on Makar Sankranti, Til Gur has come to be synonymous with the festival. 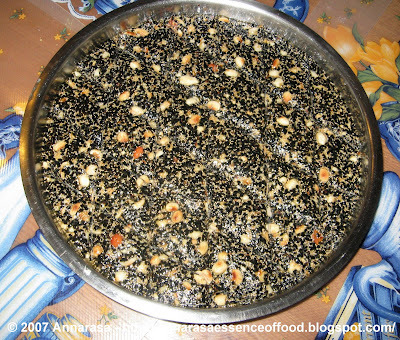 While Til Gur is often made with white sesame seeds, I have always preferred the taste of black sesame seeds. They impart a delicious flavour and when combined with jaggery give a sparkling look to this evergreen sweet. Here's my recipe for the nuttiest, smokiest, and crunchiest Til Gur ever!! Dry roast the sesame seeds on medium heat until it changes colour and gives off a sweet fragrance. Set aside to cool. Roast the peanuts in the same pan until the skin begins to fall off, and the nuts become golden brown. Remove into a separate plate. Once cool, remove the peels, and crush coarsely. Place a heavy-bottomed pan on the hob. Put 1/4 cup water into this and warm slightly. Now add the jaggery and one teaspoon ghee. Cook until it begins to bubble and splutter. Be careful at this stage as the heated jaggery might fly out of the pan. Keep stirring until the jaggery acquires a thickness. 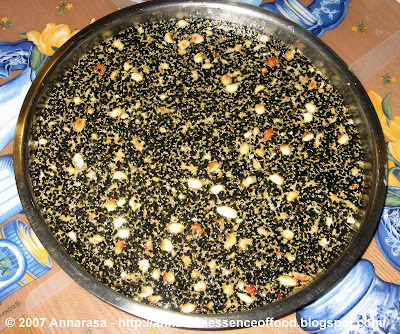 Add the sesame seeds, peanuts, and cardamom powder to the jaggery. Mix well, and cook for 2-3 minutes. Grease a cookie plate or pan with some ghee. Remove the Til Gur into the thali. Quickly pat down evenly. Once the Til Gur begins to set, mark out squares or diamonds of a desirable size. Cut into pieces once the Til Gur is completely cool. Store in an airtight container and enjoy with hot tea! !